The 40th anniversary and 38th Speech and Prize giving day over the weekend, climaxed the 40 years week long anniversary celebrations of Edinaman Senior High School (EDISEC) in Elmina in the Central Region. The anniversary which was graced by eminent luminaries such as Dr. Nana Kweku Nduom (Snr. Vice President, Business Development Group Nduom) and the Acting Vice Chancellor of the University of Education, Winneba, Professor Anthony Afful Broni, was under the theme, “The school and stakeholder, partners in achieving academic and moral excellence”. The event which was held at the schools premises saw some students receiving honors for their excellent academic performances for the year. In a speech read on her behalf, the Deputy Education Minister and Member of Parliament for Cape Cost North, Hon. Barbara Ayisi Acher stated that “for a society to succeed, its leaders must be able and willing to prioritize the education of its citizenry in order to realize the vital link between education and development”. This, she indicated, was one of the major reasons the government implemented the free senior high school initiative to enable every Ghanaian child in the senior secondary level get access to free quality education. On his part, Ag. Vice Chancellor of the University of Education, Winneba, Very Reverend Professor Anthony Afful Broni, charged various stake holders of the school not to relent in their responsibilities. He advised parents to monitor their children’s academic progression or otherwise and partner the schools to bring out the best in the students. Very Rev. Prof. Broni commended the Nduom family for their continuous support to the school and encouraged all to do same since government, although willing, might not have the muscle to decipher all our educational demands. Dr Kweku Nduom in his address indicated that the best gift a nation or a parent can give to their children is good education hence the reason Dr Papa Kwesi Nduom keeps lobbying for free, continues, compulsory education from kindergarten to senior high school for every Ghanaian child. He assured the school of the continuous support of Groupe Nduom and encouraged students of the school to take their academic work seriously to enable them accomplish their individual goals. As part of its numerous support to the school, Groupe Nduom presented a Nissan Frontier vehicle to the school to facilitate its operation. 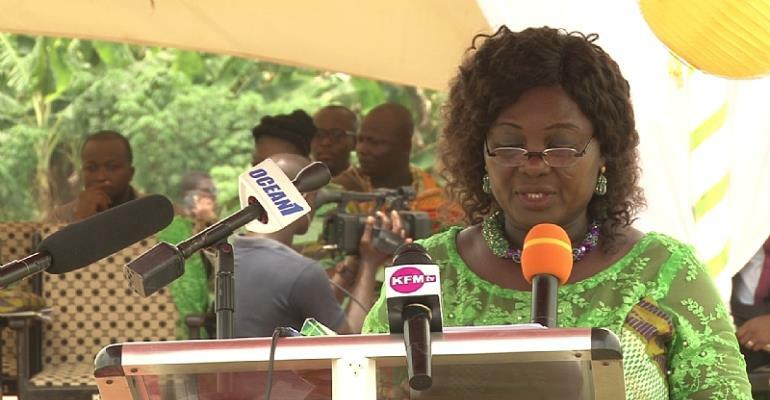 In her delivery, Mrs Agatha Harry, headmistress of the school lamented on how the school brawls to prevent encroachers from the school land, property and students owing to the unavailability of boundary wall. She asked stakeholders to assist the school with a boundary wall which will also add value to monitoring and supervision of the academic milieu. Mrs Harry expressed her profound gratitude to teachers and students for their outstanding performance in the regional Science and Maths quiz which placed the school first in the competition propelling them to the national levels. The flamboyant event was condensed with displays from the schools cadet corps, schools choirs among others.